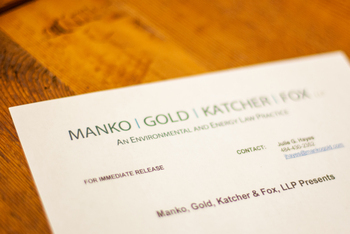 Partner John Gullace of the environmental, energy, litigation, safety and land use law firm of Manko, Gold, Katcher & Fox, LLP (MGKF) located just outside Philadelphia, PA, recently moderated the American Bar Association's Section of Environment, Energy, and Resources (ABA SEER) program entitled, "Superfund Year-In-Review” on February 23, 2018. During this one-hour program, the panel reviewed select cases and developments from 2017. They also shared their insights from the Centerdale litigation and weighed in on the court’s ruling that a potentially responsible party had sufficient cause for non-compliance with an EPA Unilateral Administrative Order, because the selected remedy, in part, was arbitrary.